My name is Gen Shimizu, and I’m the founder of Yama Mountain Gear. First and foremost, I’m a hiker. I love long distance hiking, going out and backpacking for months on end. On the trail, I’m known as Magnet, for being an animal magnet — I have a propensity to attract wildlife on the trail. When I’m not on the trail, I’m in the workshop here, designing and crafting gear to help other people get out and make the most of their time outdoors and to travel as efficiently as possible. I have so many hiking stories. I traveled the Appalachian Trail in 2004, and on my first night on the trail I woke up in a hammock with a bear underneath me. The bear stole my backpack and ran off with it. That was my welcome to the trail. On the third night, I woke up with a skunk in my face. There are a lot of stories like that. 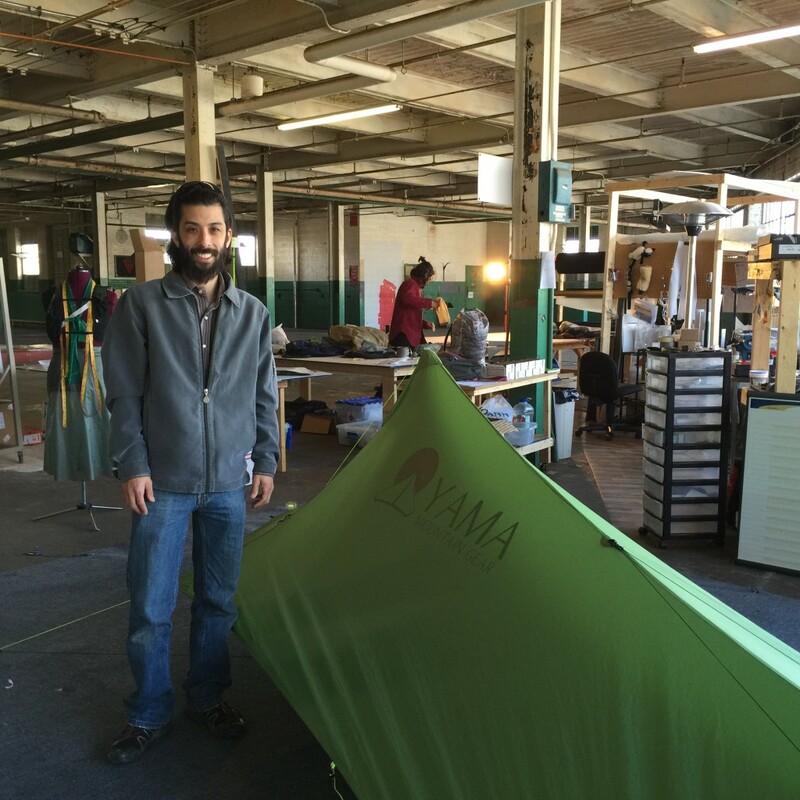 I started Yama as a way to try to enable this lifestyle and to create opportunities to get out on these trips. I also had a vision of the business extending beyond that, of creating a community of outdoors-minded people, of enabling their lifestyles and also leveraging them, of bringing their experiences back to the design table. More specifically, Yama came to be when I was out in 2006 hiking the Pacific Crest Trail. I was talking with friends out there about how we would start our ideal gear business. When I left the trail three months later, I decided to start making some gear and give it a go. Yama is a coming-together of my personality, of all of the different things I like to do. I’ve always liked to build things, and to make things with my hands. I like to design, and to work on the overall big-picture of the brand, rather than to focus on one smaller aspect as is often the case in a typical job. Waynesboro is the perfect little trail town for us to be in, primarily because of the proximity to Appalachian Trail hikers. You’ve probably seen the dirty, stinky thru-hikers hanging out in town — what they’re doing is stopping in to pick up food and supplies for the next stretch of the trail as they hike from Georgia to Maine. For us, it’s great to be able to be so close to them, so we can be that much more integrated with their community. It’s also really nice to see Waynesboro putting an active effort into catering to the hikers, and to ensure that they have a good experience while they’re in town. It gives us opportunity to not only be involved with the hiking community more closely, but also with the community of Waynesboro. It’s good for everybody. I lived in Charlottesville for roughly 18 years before coming here. Waynesboro is a big move for me, but it also made a lot of sense. For me personally, it puts me 30 minutes closer to everything I like to do, because what I like to do is hit the trail and be in the woods. If I’m not in the shop then I’m on the trail testing gear or chasing down animals, or running away from them! My biggest challenge getting started, which continues to be one of the largest challenges, is the juggling act that we have to play as we grow. Which came first: the chicken or the egg? In order to advance to the next step in business, often the chicken and the egg need to happen at the same time. That can be tricky to orchestrate. It takes a lot of creative thinking to get to the next step. It’s come into play in hiring our first employee, and often even in just buying materials, keeping items in stock, and more. I wish I had known how limiting the business could be on the reasons that I started Yama in the first place. One of the reasons I started was to enable a hiking and traveling lifestyle. Starting Yama has allowed for that, but at the same time it has limited it. Often, I have to remain in the shop to fulfill orders so customers can go on their trips. If I am able to get out, it’s often scheduled around bad weather rather than good, so that I can test gear and see how it handles those conditions. I think if I had known all of those sacrificed in advance, I still would have gone the route that I have. But it’s definitely been eye opening. It is definitely being a part of other people’s hikes. For me, I know how impactful my first big Appalachian Trail hike was and how it’s altered the course of my life. A lot of my customers are buying these shelters for use on similar trips. Knowing that I’m a piece of a point in their life that will have a huge impact on them is very important. ← First round of small business training opportunities announced — Sign up now!